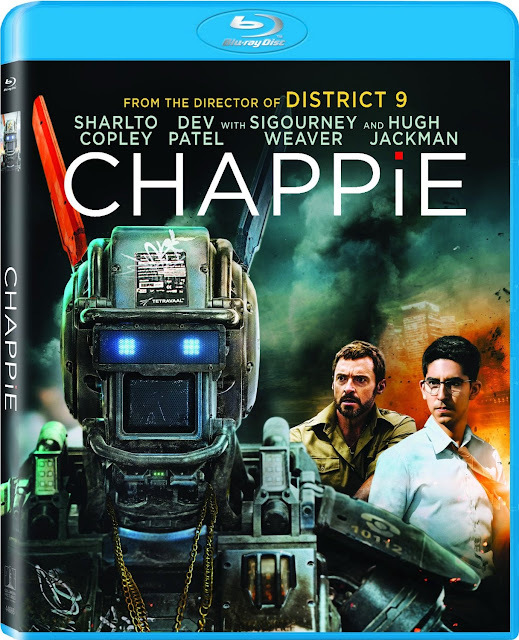 Out June 16th, Chappie's DVD and Blu-Ray cover comes out and it seems like it was handed over to a poorly paid intern in the graphic design department of Sony. After just seeing the film, I just saw it, the cover resonated how much of a waste the entire film was and that director Neill Blomkamp needs a writer as he copied his own films he already made. The third movie is the first two, but just not as good as his first feature film. We plan on doing a video break down of the problems in the film from the bizarre Tetravaal corporation that has a billion dollar robot empire, but has the cheapest office on Earth. The most brilliant robot scientist on Earth has a dinky little cubicle and never goes to a robotics lab. He doesn't have a robotics team underneath him or his own staff. The CEO has a corner office at best. Most of this robot corporation has it's entire company on the first floor of a building. Hugh Jackman plays a villain who can never be taken seriously because he wears shorts.